Editor’s note: In some countries, the law allows people to make a single backup for the purchased DVD for the learning and research purpose. While in some other countries, you can freely deal with the things you purchased but you can’t infringe the copy right. Thus, ripping DVD would be at a risk of defying the Digital Copyright Act. Why Rip DVD to MKV? MKV, short for Matroska Multimedia Container, is a file format, not a video format. As it can support various audio, video, picture and subtitles tracks in one MKV file, it can nearly keep the video and audio quality as the original DVD file. And latest smart TVs can fully supports MKV format playback. I believe most of you like to watch favorite DVDs to spend a family night. Ripping DVD to MKV or backup DVDs to hard drive with MKV will let you protect DVD discs from scratched by naughty kids while enjoying same high-definition DVD original video. MakeMKV is a famous format converter for Windows (XP or later), Mac OS X (10.6 or later) and Linux. It is able to convert Blu-ray and DVD discs including the encrypted to MKV with all video, audio tracks, chapters and meta-information preserved. MakeMKV won’t change the information in any way. This MKV ripper is very powerful, because third-party software isn’t needed to help decrypt discs. Another unique feature is that it is able to instantly stream decrypted MKV video to wide range of players without intermediate conversion. * Work on multiple platforms. * Output is limited to MKV. * It’s difficult for beginners to select DVD content. * Picture quality is poor. * You may get an error message when it reads disc. Although the guide: http://www.brorsoft.cn/how-to/rip-blu-ray-with-makemkv.html is for ripping Blu-ray to MKV, the steps for ripping DVD to MKV is almost the same, just import your DVD disc instead. 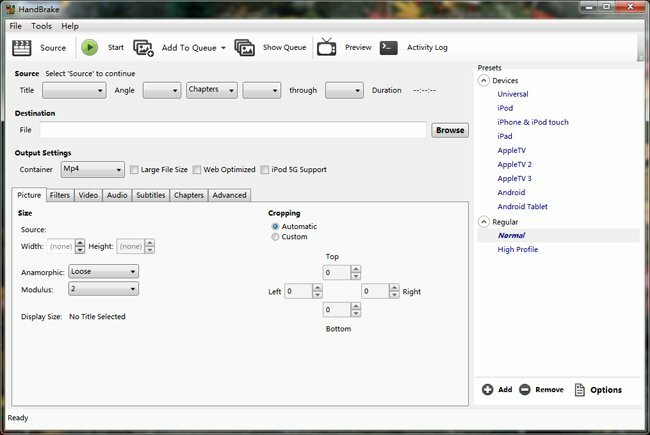 Another MKV ripper to be introduced is Handbrake – a badly famous open source video transcoder. This program allows users to convert common multimedia files to MKV and MP4, as well as rip BluRay and DVD sources without built-in copy protections to MKV and MP4. No matter what OS you’re using, Windows, Mac or Linux, you can give this MKV ripper a try. It also allows you to adjust resolution, crop video, set video audio codec, framerate and so on. * Workable on multiple platforms. * Copy-protected sources aren’t supported natively. * Various errors happen during DVD to MKV ripping. You can follow the guide: http://www.brorsoft.cn/rip-dvd/rip-dvd-free-with-handbrake.html to rip DVD with Handbrake. We talked quite often about MakeMKV, DVDFab, HandBrake, DVD Decrypter, it’s time to infuse new blood into the big family – Brorsoft DVD Ripper / for Mac. It should be the best MakeMKV Alternative when ripping DVD to MKV, and the Hnadbrake Alternative when converting DVD to MKV and other video formats such as AVI, MP4, MKV, MOV, WMV, FLV, VOB, etc and HD video formats. * Detect correct main title automatically. * Available to tweak video audio parameters. Only 3 steps to complete the DVD to MKV process: Load DVD > Choose MKV Format > Get Started. Optionals, turn to http://www.brorsoft.cn/dvd-ripper-mac/tutorial.html (for Mac) or http://www.brorsoft.cn/dvd-ripper/tutorial.html (for Windows). Please feel free to share this post if you think it is helpful!